Airline network news and analysis group anna-aero reports that domestic South and Central American services top the Americas and Caribbean route rankings, even though US airports and airlines dominate the market in terms of available capacity and account for more than two-thirds of the region’s weekly departing seats. In fact, anna-aero reports that the four largest routes are all domestic services in South or Central America and the Rio de Janeiro Santos Dumont to Sao Paulo Congonhas route is the region’s busiest airport pair in Summer 2018 (S18). 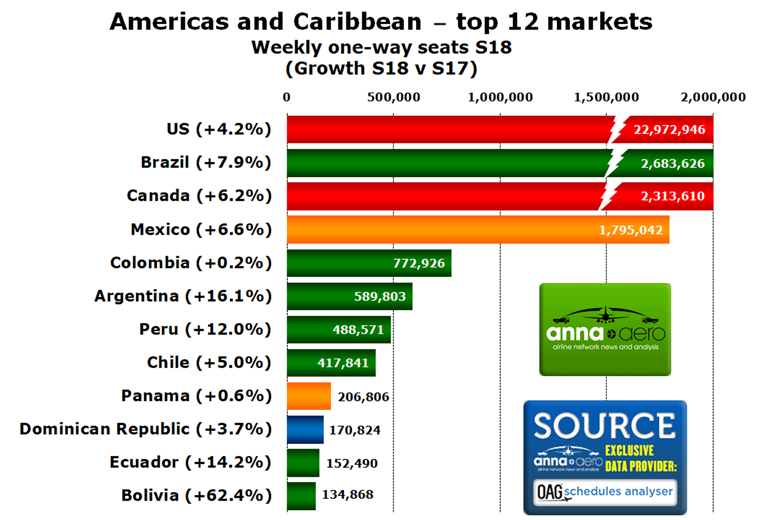 There are 33.89 million weekly one-way seats available from airports in the Americas and Caribbean region in peak S18. This represents a 4.5% increase compared to S17. About 79% of this capacity is scheduled for domestic operations, although it should be noted one-way seats on internal services are counted in both directions, while international capacity to destinations outside of the Americas and Caribbean region is only counted in one direction. The US is the largest market in the region for one-way seats. Nearly 23 million seats will be available from US airports during the week commencing July 31, representing 68% of the region’s total capacity. US airports will offer 19.76 million seats on domestic services and 3.21 million on international links, equivalent to 74% and 46% of the respective total capacity in the Americas and Caribbean for the week. The top 12 country markets in the Americas and Caribbean include the US and Canada in the first and third spots. The rest of the top-ranked markets feature seven South American countries (highlighted in green), two Central American nations (highlighted in orange) and one from the Caribbean (highlighted in blue). Brazil is the largest country market in the region after the US, while the only Caribbean representative in the top 12 is the Dominican Republic. For all but two of the top 12 markets, domestic capacity accounts for around two-thirds or more of the total available seats. Only Panama and the Dominican Republic are dominated by international traffic, with 94% and 99% of their respective departing seats operating to international destinations. All of the top-ranked countries have witnessed an increase in capacity for S18 compared to the equivalent peak period last year. The top 10 remain in exactly the same positions they occupied in S17 but Ecuador moves up a place to 11th and Bolivia replaces Cuba at the top table after a 62% jump in departing seats, largely due to strong growth on domestic services. Source: OAG Schedules Analyser – non-stop flights only. Data is for week commencing July 31. 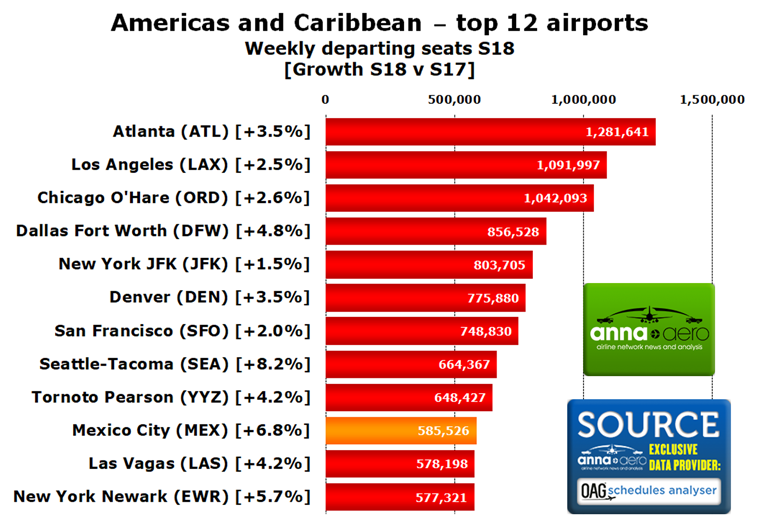 Ten of the 12 busiest airports in the Americas and Caribbean region in S18 are located in the US (See chart on next page.). The highest-placed airport outside of the US is Toronto Pearson, in ninth position. Mexico City also makes the top 10 and is the only top-ranked airport outside of North America. The highest placed airports from South America and the Caribbean are Sao Paulo Guarulhos and San Juan which are in 17th and 70th position respectively. Only New York JFK (57%) and Pearson (59%) will see more seats departing on international services than on internal flights. All of the top 12 airports witnessed an increase in departing capacity this summer compared to last year. The largest growth has taken place at Seattle-Tacoma and Mexico City. In total, OAG schedules show that 1,379 airports in the Americas and Caribbean region will see scheduled services during the week commencing 31 July, with 19 of these welcoming just one weekly flight. The top four airlines for departing seats in the Americas and Caribbean region are all US-based operators. The US Big Three (USB3) of American Airlines, Delta Air Lines and United Airlines, occupy first, second and fourth positions. Between them they account for 13.79 million departing seats, which is equivalent to 41% of those available from the region. Nine of the top 12 carriers are North American-based operators, with seven of these being US airlines. Air Canada and WestJet were the two Canadian operators. The remaining three airlines to make the top 12 are all from South America. LATAM Airlines is the largest of these with 1.64 million weekly seats on offer. The highest ranked carriers from Central America and the Caribbean are Azul Airlines and Caribbean Airlines which are in 13th and 33rd place respectively. All of the top 12 carriers have experienced an increase in capacity this summer compared to the equivalent peak week in S17. LATAM Airlines has seen the largest year-on-year growth, although this appears to be a result of published capacity being transferred to its LA IATA code from LATAM Brasil’s JJ code, with the latter still operating a significant proportion of flights. If the published LATAM and LATAM Brasil capacity for S17 and S18 is combined, the equivalent year-on-year growth rate is a more reasonable 5.4%. 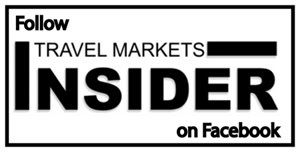 Schedule data suggests that 267 airlines will offer at least one scheduled departure from airports in the Americas and Caribbean region during the week commencing July 31. The smallest operator is Norlandair which will offer one flight between Greenland (considered part of North America) and Iceland using a nine-seat twin turboprop. 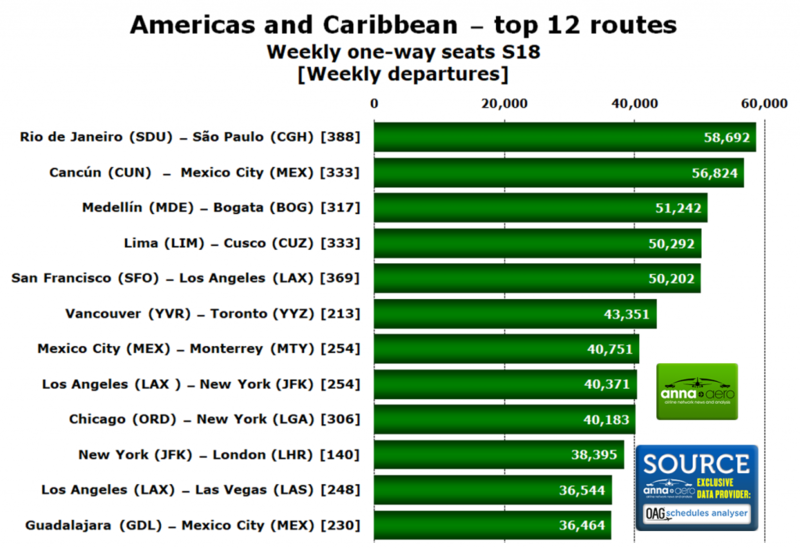 Despite the pre-eminence of the US in the Americas and Caribbean market, the four largest routes in the region, based on weekly departing seats in S18, are domestic links in South or Central America. In total 11 of the top 12 routes are domestic, with four in the US, three in Mexico and one each in Canada, Brazil, Colombia and Peru. The only international route in the top 12 is the JFK to London Heathrow connection which is in 10th position. The largest route originating in the Americas and Caribbean region this summer is the link between Santos Dumont and Congonhas. Nearly 59,000 weekly one-way seats will be available on this internal Brazilian airport pair in S18, with three operators offering a combined 388 departures. Mexico City and Los Angeles, appear the most in the top 12, with each airport featuring as the origin or destination in three of the top-ranked routes. Nine of the top 12 have experienced an increase in weekly capacity this summer, with the strongest percentage growth coming on the Mexico City-Monterrey (24.2%) and Guadalajara-Mexico City (19.7%) sectors. Three of the routes have witnessed a decline in seat numbers, including the only international link in the top 12. However, the most pronounced cuts are Canadian, with the Vancouver to Pearson airport pair seeing a 5.9% reduction in one-way seats. The smallest scheduled service in the region is a link from Ouzinkie to Port Lions in Alaska, which is operated once during the week commencing July 31. The route is flown by Island Air Service with a small Piper aircraft and only five seats are available. This analysis used a number of assumptions. The Americas and Caribbean region includes all countries grouped into the following global groups by OAG; North America, Latin America: Caribbean, Latin America: Central America, Latin America: South America. Typical peak S18 capacity and frequencies are taken from OAG schedule data for the week commencing 31 July. Where comparisons are made with last summer, the data refers to the week commencing 1 August 2017. The capacity included in the analysis accounts for any flights departing from airports in the Americas and Caribbean region. This includes all domestic and intra- and extra-regional international flights. On domestic and intra-regional international links capacity is counted in both directions on an airport pair. For extra-regional international services, seat numbers are only counted in the outbound direction.